Dr. John McLaughlin passed away surrounded by family on January 7, 2017. This website is maintained to honor his work and the inspiration which he offered to those who knew him. Learn more about Dr. McLaughlin. After painstaking research and careful assessment of the career of General Albert C. Wedemeyer, John McLaughlin published a must read for history buffs. It is available on Amazon and in book stores. Rated 5 Stars on Amazon. Learn more about this intriguing facet of American History. General Wedemeyer is the only American to have ever attended the German General Staff School, (Kriegs Akademie), the equivalent of our Fort Leavenworth Command and General Staff School. Wedemeyer was there in the critical pre-war years of 1937-1938 and was introduced to all of the German tactics of modern warfare such as armored infantry assault with supporting aircraft, lighting pin point assault in force (Blitzkrieg) all of the tactics which the Germans used so successfully in the early years of World War II. Upon his return to the United States he submitted a comprehensive and detailed report to his superiors which ultimately was passed on to President Franklin D. Roosevelt who was very much impressed. Ultimately, Wedemeyer was put in charge of the committee that formulated plans for the invasion of France in the summer of 1943 by Allied armies. 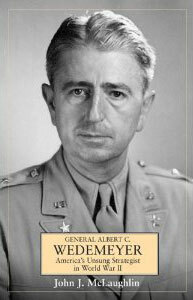 Like many heroes of the Second World War, General Albert C. Wedemeyer’s career has been largely overshadowed by such well-known figures as Marshall, Patton, Montgomery, and Bradley. Wedemeyer’s legacy as the main planner of the D-Day invasion is almost completely forgotten today, eclipsed by politics and the capriciousness of human nature.Yet during America’s preparation for the war, Wedemeyer was the primary author of the “Victory Program” that mobilized US resources and directed them at crucial points in order to secure victory over the Axis. The British planners, were not keen on an invasion of France at any time. Private letters and diaries of the British planners reveal that they considered the Americans amateurs at war. Ultimately, the British with their superior negotiating and diplomatic skills, developed over centuries of dealing with Byzantine European politics, prevailed, and the 1943 invasion of France never took place as Wedemeyer and the Americans envisioned. Although the British were never in favor of any invasion into France, at any time, they were ultimately compelled to accede to the American plan for an invasion in 1944 one year later. During that one year the Nazi’s, with the help of the brilliant General Rommel were able to substantially improve the defenses on the Atlantic wall. Many historians now believe the delay of one year was responsible for the needless loss of many additional lives.